Unlike in his white attire; the Leader of Indigenous People of Biafra stormed Abuja High Court; his anticipated appearance was a relief to the Indigenous People of Biafra that had spent hours waiting to see him as they shouted like victorious people. To some Biafrans; seeing Nnamdi Kanu is seeing a hero who has sacrificed everything for them while to some, seeing Nnamdi Kanu is seeing the greatest man they have ever come in contact or had as their own. To me; seeing Nnamdi Kanu is seeing an epitome of wisdom and perfection of mankind through Chukwuokikeabiama. Looking so rejuvenated and gorgeous; a handsome man that would cut through the eyes of Queens and Princesses; he is neither perturbed nor showing any sign of pale. One would have expected him to wither since he was denied bail in the last Court hearing, but he seems not be in a hurry as restoration of Biafra is all he wants. 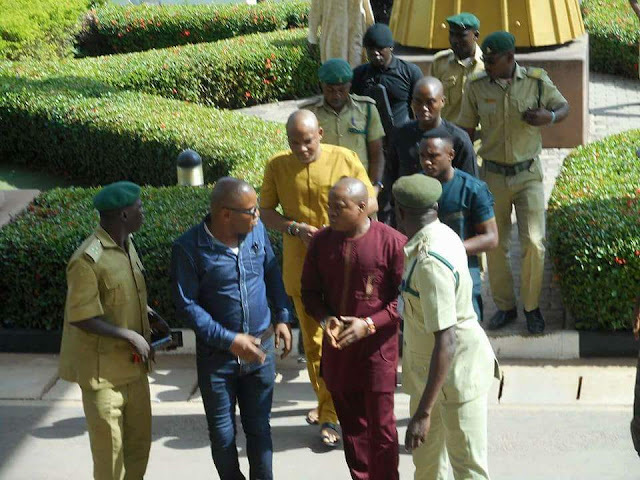 Walking majestically into the Court room; being hailed by the Indigenous People of Biafra, a section of the people he is in that prison for, a section of the people he is being tried for. Gallantly he walks in; Nigeria Government will continue to disgrace itself while the Leader of Indigenous People of Biafra takes credit of everything. One thing seems to have kept him going; the love Biafrans have for him, as he was flanked by Warders; more like a champion is being escorted into the Court room; in his dull yellow to match ‘senator’; smiling boldly, the journey is coming to an end; victory will be his own, he seems to be very certain. 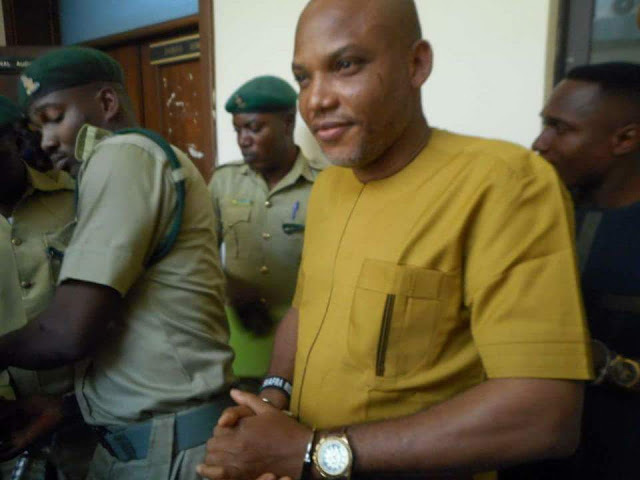 One thing is certain; Nnamdi Kanu seems to have understood that his continued detention is the price he has to pay and such price he is confidently paying. It is a disappointment for the people that incarcerated him thinking he would be psychologically battered. He has won and shown that incarceration has not and cannot affect his resolve. He also seems confident of his freedom as he walks into the Court room; one thing is very much certain, a new Sheriff is in town and justice will be done very soon. Nnamdi Kanu has done nothing, he has gained momentum, his name has reached to the end of the world and his continued detention will make him more powerful. He has come to take advantage of the bigotry and stupidity of Nigerian establishment. Justice Binta Nyako is being expected to rule today if secret trial will hold or not.